A small group of people has a condition that allows them to perceive thousands of colors that regular humans can’t see. It’s no secret that other animal species, including some fish, birds, and insects, have completely different experiences with sight than humans. They’re able to see light with frequencies outside the human “vision spectrum,” exhibiting color ranges that we’re unable to see. However, their extensive color visions serve some type of clear evolutionary purpose, like insects being attracted to pollinate certain plants that attract them with their vibrancy. Artist Concetta Antico is a tetrachomat who sees far more hues than the average person. (Courtesy of Concetta Antico). Courtesy of a condition known as “tetrachromacy,” some humans can, too, see an assortment of colors invisible to the rest of the human race. It’s possible they may see a hundred million colors, plenty of which are additional shades and subtle hues of colors that the rest of us can’t even imagine. It’s not yet known if the condition serves some sort of evolutionary purpose, or if these humans just happened to be blessed with “superhuman” vision. Tetrachromacy occurs when a gene variation influences an individual’s retina development. Almost everyone, aside from the colorblind, has three types of working “cone cells” in their retina that respond to different bandwidths of light: red, green, and blue. It’s assumed that tetrachromats have an extra cone, which would offer a hundred different variants to every single color that humans normally see. How is this possible? The gene for our red and green cone types sits on the X chromosome, and since women have two X chromosomes, they could carry up to two different versions of each gene. Although the majority of women have two identical genes for each cone, tetrachromats may have one cone that is sensitive to slightly different elements of the color spectrum. For these reasons, tetrachromacy is typically thought to be a condition exclusive to women, but researchers haven’t dismissed the possibility that men may inherit the condition as well. You may be wondering how it was even possible to verify that some people see thousands of extra colors when the rest of us can’t see them ourselves. Dr. Gabriele Jordan, a specialist in color vision at Newcastle University in the U.K., found a way to test for people with a hypersensitivity to basic colors. By mixing yellow and blue, most people couldn’t determine which parts of the subtle olive green mixture were yellow and which were blue. But subjects with a fourth cone were able to differentiate between the two colors in the mixture each time without hesitation, often seeing a number of other color shades that no one else detected. 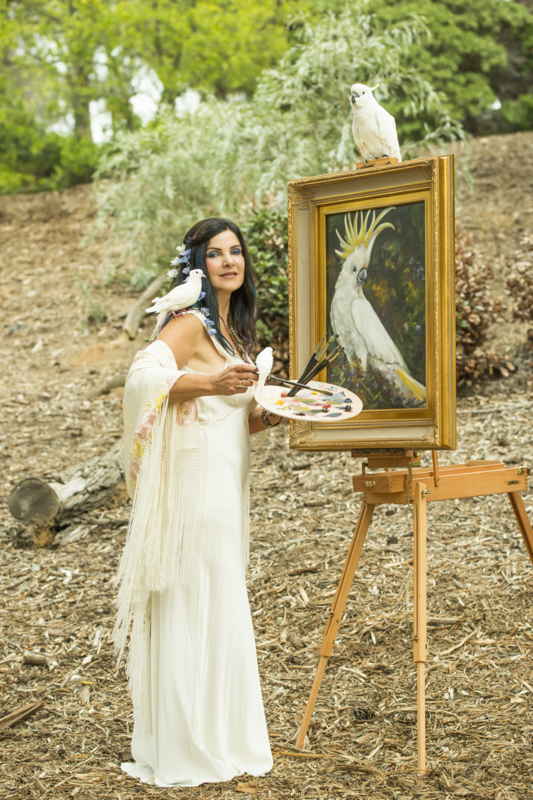 It’s difficult to try and visualize what tetrachromats see in their everyday surroundings. However, Concetta Antico, one of the few humans with the condition, attempts to share her perception of the world through her art. In the picture below, you can see her vision of what, to us, looks like a regular tree in a park. While we see tree bark as a mixture of browns, Antico sees violets, lime greens, and yellows. You can check out her art gallery here. While you may be wishing you were born with that extra cone cell, Antico explains it’s not always a blessing. “People find that extraordinary that white is my favorite color, but it makes sense because it is so peaceful and restful for my eyes. There is still a lot of color in it, but it’s not hurting me.” She says the grocery store is a nightmare, with colors shooting into her eyes from every angle.